It's very easy in this business to bury ourselves in complexity. Typically leading to nothing but feelings of extreme overwhelm and doubt. It can help at these times to "step back" a little and look at the bigger picture. At a simpler level, what exactly are we trying to achieve here? 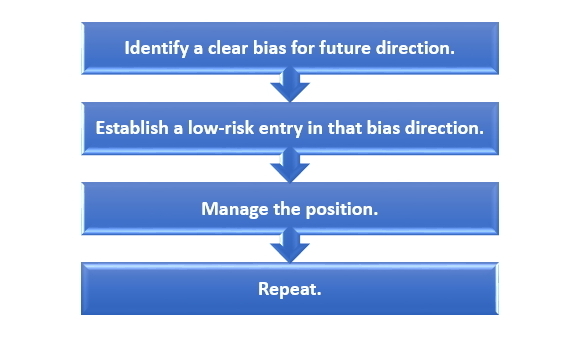 I would suggest that many of us could describe our trading by the following "simplified" flowchart. When you get one wrong, work to contain the damage as much as possible. When you get one right, work to take as much profit as you can out of the move. Aim to keep the losses smaller than the wins, on average. Record data on your decisions and performance. Identify what adds to your edge across a large sample of trades. Seek to understand why. And do more of it. 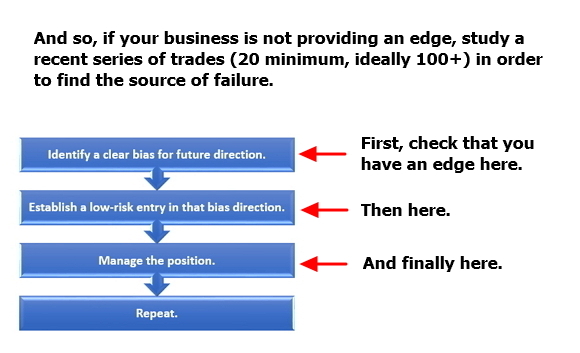 Identify what reduces your edge across that same large sample of trades. Seek to understand why. And aim to avoid it or reduce the damage. Essentially, that's how I run my trading business. But perhaps the best use for this "simplified" flowchart is in it's ability to help us find the way forward when we're stuck. Because the same flowchart can be used to guide our learning process. And to narrow our focus to ONE AREA OF IMPROVEMENT at a time. We won't get it right in every trade, of course. But our aim must be to learn to do so with sufficient frequency to provide an edge across a series of trades, assuming acceptable trade entry and management. Again, we won't always get this perfect. But we must get it right sufficiently often to ensure that our edge remains, assuming acceptable trade management. And once more, we don't expect to get this perfect every time. But across a large enough sample, we need to get this right enough to maintain our edge. Are you trading in the right area? Or do you need to work more on your strategy? Are you entering well enough? Or are you getting chopped up as you try to consistently pick the exact turn point? Are you holding for a reasonable portion of the move? Or are you regularly failing to manage the opportunity that is available. Success requires that you first identify the source of current failure. So simplify! And then narrow your focus to one area at a time. Do you need to work on your trade areas? Or trade entry? Or trade management. Suppose my bias is long and I am looking at weakness in downmove to fade. Then with reference to your above statement, to avoid being “chopped up” I need to either give the trade good room of SL or enter when weakness against my bias has given was to strength in direction of my bias. It’s all contextually dependent. Naturally. But yes, the entry point PLUS the initial stop location PLUS the initial management plan MUST be suited to the conditions provided. As best we can. So if you have a choppy overlapping pullback, then you should consider something appropriate for those conditions. This might be a wider stop (with smaller position sizing) as you suggested. Or it might be waiting for some sign of strength first. Adapt to the conditions the market provides.